A Guatemalan woman and her three daughters at the border fence after crossing into El Paso, TX from Ciudad Juarez, Mexico. The wave of migration driving Trump’s meltdown, explained. President Trump is madder than ever about the US-Mexico border. He’s in the midst of a purge of his Department of Homeland Security — including Secretary Kirstjen Nielsen — in anger that it’s not doing more to stop people from coming to the US. He’s carried out a longstanding threat to cut aid to Guatemala, Honduras, and El Salvador, the countries of origin for most current border crossers. And he’s threatened to close the US-Mexico border entirely (in other words, close the ports) if Mexico doesn’t “largely stop” the flow of unauthorized migration in the coming year. To a certain extent, Trump’s tantrums about the border have become the background noise of this administration. But this time is different — not just because Trump is madder than ever, but because he has more reason to be worried about unauthorized migration than he has ever had. The past two months have seen a huge spike in unauthorized migration, especially of families, into the US. The government’s capacity to handle an influx of large groups of children and families was already under serious strain at the end of last year. It’s now obviously overmatched — in what politicians of both parties are recognizing as a humanitarian crisis. This isn’t a manufactured crisis, or a politically engineered one, as some Democrats and progressives have argued. If it were, it would be easier to solve. What’s happening at the border is the result of a regional crisis in which — if current rates continue — close to 1 percent of the entire population of Guatemala and Honduras will attempt to immigrate to the US this year. The Mexican government, meanwhile, is vacillating between humanitarian rhetoric and militarized crackdowns, US border officials are openly begging for help, and Trump himself is throwing the mother of all temper tantrums. Trump’s threats will likely cause massive collateral damage throughout North America and aren’t even likely to stop people from arriving at the US-Mexico border — his stated goal. But that doesn’t mean there isn’t a problem here, or even a crisis. It just means it’s not one that’s going to be solved anytime soon. 1) Is there an unprecedented surge of unauthorized migration into the US? Yes — or at least, probably. But of a specific kind. The total number of people coming into the US without papers is still lower than it was for most of the 20th century, and substantially lower than its turn-of-the-century peak. The total number of people coming into the US without papers is now higher than it’s been since early 2007 — before the Great Recession — with February and March 2019 levels exceeding the child migrant crisis of 2014. The number of people coming into the US without papers who can’t simply be detained and deported — children, families, and asylum seekers — is almost certainly unprecedented. By this point, it’s not just that there are more children and families coming than have in recent years. There is substantial evidence that the raw number of children and families entering the US is higher than it’s ever been. We don’t have apples-to-apples data. Right now, DHS separately counts “unaccompanied alien children” who come without their parents, and migrants who come in “family units” of one or more parents with one or more children. Before 2011, though, it combined juveniles who came with parents and juveniles who came without them — and simply counted parents traveling with their children as adults. We do know, however, that very few of all migrants apprehended were juveniles in the early 2000s compared to today — so even during peak unauthorized migration, rarely more than 100,000 juveniles a year were crossing. And the majority of those were coming without their parents. So if the statistics had been kept in the same way in the early 2000s that they are now, they almost certainly wouldn’t have shown more than 150,000 unaccompanied children and family units coming into the US even during peak years. So far in fiscal year 2019, the number of unaccompanied children and family units apprehended is almost 250,000. And we still have half the year to go. 2) Why can’t all border crossers simply be deported? The US border enforcement system is built to apprehend people who are trying to sneak into the US, and return them to their home country as quickly as possible. For most of US history, apprehended migrants were just informally returned to Mexico. In the mid-2000s, the US started formally deporting apprehended migrants instead — using “expedited removal,” which allowed people who got caught entering the US to get deported without going before an immigration judge. Typically, a migrant would be apprehended by Border Patrol officials, transferred to Immigration and Customs Enforcement (ICE) custody within 72 hours, and deported once a deportation order could be signed. But there are extra legal protections built into US law and policy for asylum seekers — who can’t simply be deported — and for vulnerable groups, including children and families, who can’t simply be detained. Asylum seekers — whether they have presented themselves at a port of entry to ask for asylum (breaking no US law) or crossed into the US between ports of entry (committing the misdemeanor of illegal entry) and evoked their right to asylum after being apprehended by a Border Patrol officer — can’t be deported until they’ve been screened by an asylum officer to see if they have a “credible fear” of persecution. Unaccompanied children from non-Mexican countries have to be transferred to the care of the Department of Health and Human Services within 72 hours and are guaranteed immigration court hearings. Families, under a 2015 court ruling, can’t be detained indefinitely; generally, the government has to release them after about 20 days. In all three cases, the “detain, then deport” system doesn’t work. The system is overloaded with people it wasn’t designed to handle. 3) Why are people coming to the United States to begin with? The simplest answer is probably the truest: because things are bad enough for them in their home countries of Guatemala, Honduras, and El Salvador that they’ve decided to risk the journey to the US, and whatever treatment awaits them here, for a chance in America. 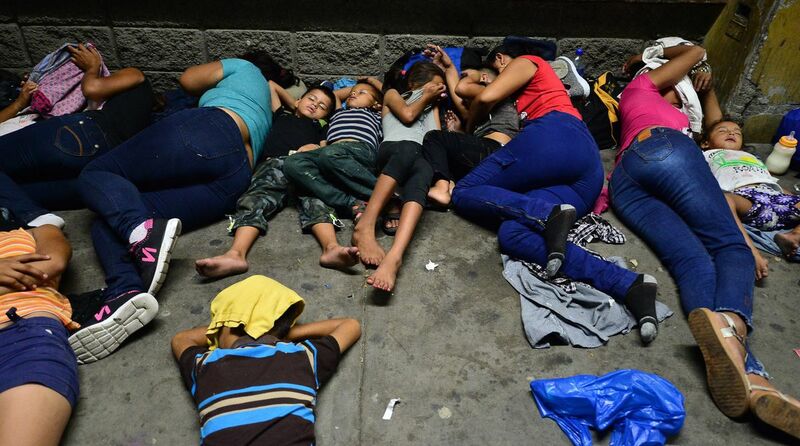 A group of Hondurans sleeps as they wait to board a bus that will take them out of Honduras in April 2019. Unless stopped by Mexican authorities — which is plausible — many will likely head to the United States, as previous “caravans” of Honduran migrants have. US law slices migrants into categories. People seeking to migrate for economic reasons or to reunite with family might have a way to migrate to the US legally, but they’re not allowed legal status if they arrive without papers. People fleeing persecution have the right once on US soil to apply for asylum, whether they have papers or not. The Trump administration claims that very few of the people coming to the US now are genuine asylum seekers, pointing to the fairly low rate of success of asylum claims in immigration court (10 to 15 percent for Northern Triangle countries) as evidence that these aren’t “real” asylees, or even to claim that most of them are outright frauds. In practice, though, it’s often hard to determine a single reason that a given migrant is leaving — much less a group of hundreds of them, or a monthly flow of tens of thousands. The same people facing dire poverty can also be persecuted by their governments for their political views; someone might decide to leave because their crops are failing, but decide when to leave based on a threat to their lives. The most pressing problem in Honduras and El Salvador continues to be violence, specifically gang violence. (El Salvador has reduced its homicide rate substantially, and migration to the US has sharply declined since last summer.) Victimization by gangs isn’t as solid a basis for an asylum claim as victimization by the government, and the Trump administration is trying to make it even harder to claim asylum due to gang violence. Guatemala, which has seen the biggest increase in emigration to the US in the current surge, is generally more beset by crushing poverty than gang violence. (Domestic violence is endemic in all three countries.) Poverty (no matter how dire) isn’t grounds to seek asylum. But it’s hard to disentangle the poverty of the Guatemalan highlands from concerns about the government’s treatment of indigenous peoples, or the poor situation of the region’s farmers from oppression of community and environmental activists challenging the government’s land use policies. Many of these migrants are choosing to come to the US rather than staying in Mexico because the US offers them a better opportunity to make money and support their families, in addition to being substantially safer, and US law allows asylum claims from migrants who pass through Mexico. (Asylum seekers who try to enter the US from Canada have to stay in Canada.) Many asylum seekers also have relatives in the US already. That doesn’t mean they don’t also have valid asylum claims. Further complicating all of this, migrants themselves don’t necessarily know what asylum is or why they might or might not qualify for it. Some migrants I’ve spoken to believed you could get asylum simply by having a relative in the US — or that if you had no family in the US, you couldn’t get asylum. (Neither is the case.) People traveling in the “caravan” last fall often told reporters they were coming to the US to work. To the US government (and immigration hawks), both of these are indicators that these aren’t “real” asylum seekers. To advocates and immigration lawyers, they’re evidence that people move between countries for complex reasons, and that some who might qualify for asylum might not even know it without help from a lawyer. 4) Why are more people coming now? Trump’s first few months in office set records for how few people were caught trying to enter the US from Mexico, something he continued to brag about even as apprehension levels began to rise again in summer and fall 2017. (The claim made by Trump critics that unauthorized migration is at “historic lows” is based on the fact that yearly apprehension rates are still low in comparison to the pre-recession era, but apprehensions have been rising pretty much every month since April 2017.) And building on a trend that had become noticeable since the border crisis of summer 2014, the people who were coming were unaccompanied children and, increasingly, families. By September 2018, DHS officials were raising alarms about the number of children and families coming into the US, and warning that the system was overwhelmed. Apprehensions continued to climb through the fall. Then in February, they skyrocketed. Large groups, like this group of 100, have become increasingly common at the US/Mexico border — contributing to the rapid spike in apprehensions of migrants in the past few months. The rise of “express route” buses that can take hundreds of migrants at a time through Mexico in five or six days appears to be a factor. Many migrants who might have felt the chance of arriving in the US wasn’t worth the risks of a grueling and dangerous journey on foot through Mexico may be changing their calculus now that the risk is lower. Similarly, anecdotal reports indicate that smugglers are offering discounts for migrants who bring their children. The other factor is Mexico. The new Mexican government of Andrés Manuel López Obrador (who took office in December) has tried to marry rhetoric about a new humanitarian approach to migration with a desire to stay on the Trump administration’s good side. In December, Mexico made it much easier for Central American migrants seeking to travel to the US to get temporary “humanitarian visas” that allowed them 90 days of legal status in Mexico. The Mexican government wasn’t prepared for how many Central Americans would seek the visas, and shut down the program rapidly. But American officials suspect the humanitarian visas made it much easier for Central Americans already in Mexico to come to the US, and may have influenced more to come. 5) Is the US system stretched to the “breaking point”? The Trump administration is certainly acting like it is. In recent weeks, the needs of migrants in custody have started to overwhelm other DHS functions. In the El Paso sector, Border Patrol has abandoned its internal roadside checkpoints, where officers check the legal status of drivers and passengers driving in the US and check for contraband. The agency has detailed a few hundred port officers to help Border Patrol agents care for families and children — slowing down the processing of people and vehicles at ports of entry accordingly, and causing hours-long lines across some international bridges. 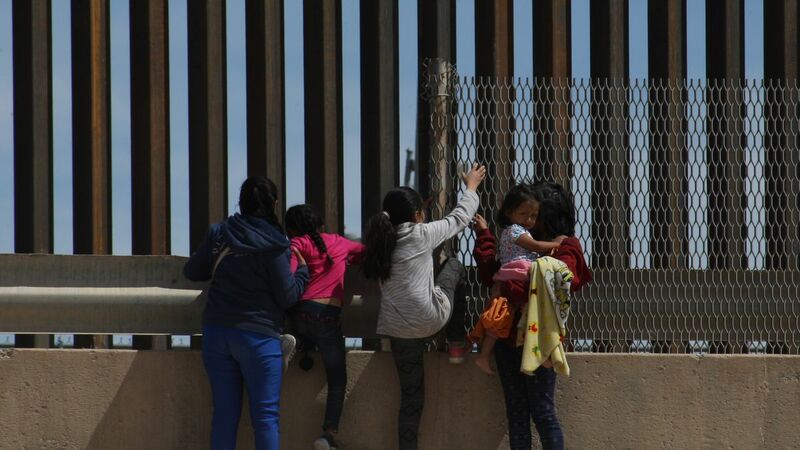 In El Paso, Customs and Border Protection kept some families in a temporary holding pen under a bridge, with some families claiming they were kept there for several days. The holding pen was shut down at the end of March, after pictures of it attracted widespread shock and outrage, but CBP agents encouraged reporters to get pictures of it — pointing to it as an example of what they were forced to do because they had no other choice. CBP has warned for months that it isn’t able to house and process the current population coming into the US, and that it has nowhere to put people between when they turn themselves in to Border Patrol agents and when they are released. The deaths of two children in Border Patrol custody in December underscored the inadequacy of CBP’s facilities, and Congress included funds in its February appropriations bill to help Border Patrol provide food and shelter for migrant families in El Paso. But that facility hasn’t been constructed yet, and a lot more families are coming now than came in December. Releasing asylum seekers from custody isn’t as easy as letting them out. Unlike immigrants who are arrested by ICE while living in the United States, many newly arrived asylum seekers aren’t familiar with the US, often speak neither English nor Spanish, and may not have appropriate clothing or funds for bus fare. They are usually released with instructions to check in with an ICE agent at a field office that could be states away. There are nonprofit organizations that can help acclimate families and get them to their destination, but that too requires advance notification and effort. When the government simply dumps people outside bus stations, they end up lost, cold, and confused. 6) Have the Trump administration’s actions contributed to the crisis? This Honduran woman and her children wait in one of the shelters in Tijuana for migrants trying to cross into the United States. Hundreds of migrants are waiting to be allowed to present themselves legally to claim asylum at the port of entry at San Ysidro. Under the Trump administration’s “metering” policy, the wait has sometimes taken months. 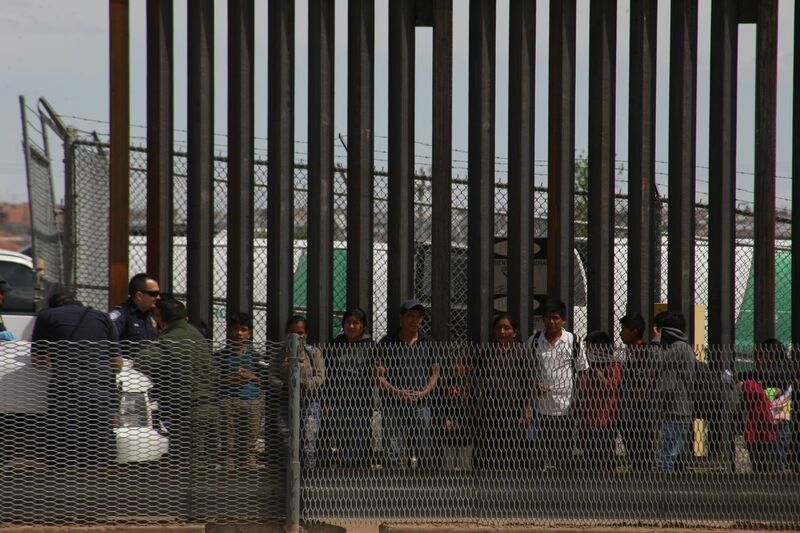 Metering varies from port to port (see this article to read about the policy in depth), but at the most popular ports of entry, it’s forced migrants to wait weeks or months before they can step onto US soil and exercise their right to claim asylum. Faced with such a wait — sometimes in dangerous Mexican border towns — it’s logical that a migrant might choose to cross illegally to present their asylum claim instead. As the number of people caught coming into the US between ports of entry illegally has spiked, the number of “inadmissible” migrants, who come to a port of entry and are found not to have valid legal status, has stayed flat. Many Trump critics point to metering as the root of the discrepancy — and accuse Trump of manufacturing a crisis by forcing people to cross illegally, then panicking when they do. It’s clear that at least some migrants are crossing illegally only because they can’t cross legally, but it’s extremely likely that the number of illegal entries would be climbing even without the metering policy. There have always been many fewer asylum seekers coming to ports of entry than crossing between them. That’s especially true in the Rio Grande Valley, which has been the epicenter of child and family migration for the past decade. Where migrants cross into the US isn’t usually their choice to make; it’s the choice of the smuggler facilitating their arrival. The emergence of new drop-off points for large groups of migrants like Antelope Wells, New Mexico, and Lukeville, Arizona, isn’t the result of democratic decision-making by migrants — those locations are the endpoints of smuggling routes. And they’re between, not at, ports of entry. 7) Is Trump right that Mexico and the Northern Triangle countries aren’t doing anything to stop migrants from reaching the US? 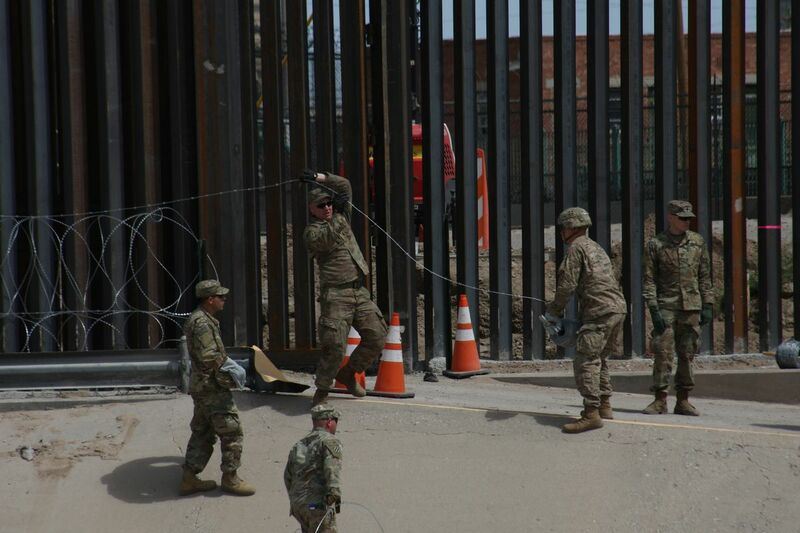 Mexican soldiers help string wire across the border fence in Juarez — part of the Mexican government’s broader cooperation with the Trump administration in deterring and interdicting migrants. Trump appears to be mad that Northern Triangle countries aren’t doing more to stop their citizens from leaving, which is not a thing that governments are supposed to do under general human rights principles, and also, more to the point, not a thing that governments can do without a massive investment of time, personnel, and infrastructure. Trump is asking governments that can’t even guarantee the safety and well-being of their citizens to monitor those citizens’ whereabouts perfectly. Guatemala, Honduras, and El Salvador have cooperated with the US on security measures; a new “compact” allowing joint policing operations between the four countries was signed by then-Homeland Security Secretary Kirstjen Nielsen and her Central American counterparts last week. The Mexican situation is more complicated. The Mexican government’s brief expansion of humanitarian visas in December really did make it easier for Central Americans to enter and move through Mexico to the US — so it would make sense for the Trump administration to be mad at them over that. But the Mexican government reversed its visa policy as soon as it became clear how many migrants were coming in. And since then, it’s been extremely cooperative — even deferential — with the US. Metering only works because of Mexican officials stopping asylum seekers before they can set foot on US soil. 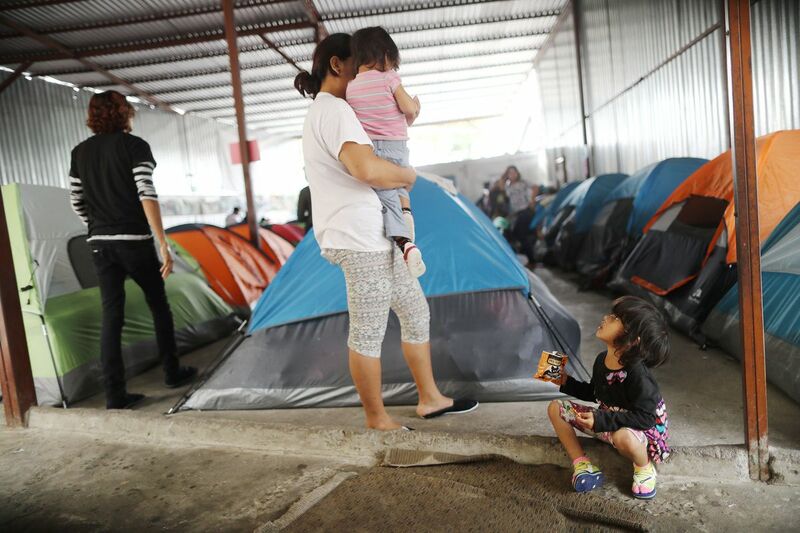 Under the “Migrant Protection Protocols,” Mexican officials allowed the US to force hundreds of Central Americans to return to Mexico and wait for their asylum cases to be resolved. In January, as a large caravan of migrants prepared to cross into a US port in Texas, a group of Mexican law enforcement officials surrounded them and detained them at an empty factory, letting out only a few a day to seek asylum; when unrest broke out at the factory, the asylum seekers were dispersed on buses to towns farther from the border. And on Wednesday night, they announced they were going to deploy the military to the isthmus connecting Mexico and Guatemala to “contain” migrants. Trump himself, however, appears to be unshakable in the belief he’s held since 2015: that the government of Mexico is at fault for anyone arriving in the US without papers. 8) Will cutting off aid to the Northern Triangle countries help? It’s not exactly clear what the parameters of the State Department’s Saturday announcement that it was cutting off aid actually are — in particular, there seems to be confusion about whether it applies to contracts that have already been signed. But because the State Department (reportedly under pressure from the Office of Management and Budget, under Trump’s acting Chief of Staff Mick Mulvaney) had been slow-walking aid from 2018, not to mention 2019, that’s still hundreds of millions of dollars potentially lost. Even Trump administration officials have endorsed this point of view — from former Homeland security secretary and Chief of Staff John Kelly, who bragged that the Trump administration was doing more than previous administrations to help the region, to CBP Commissioner Kevin McAleenan — now acting secretary of DHS — who responded to a previous Trump threat to cut off aid by telling CBS that the US needed to invest in Central America. 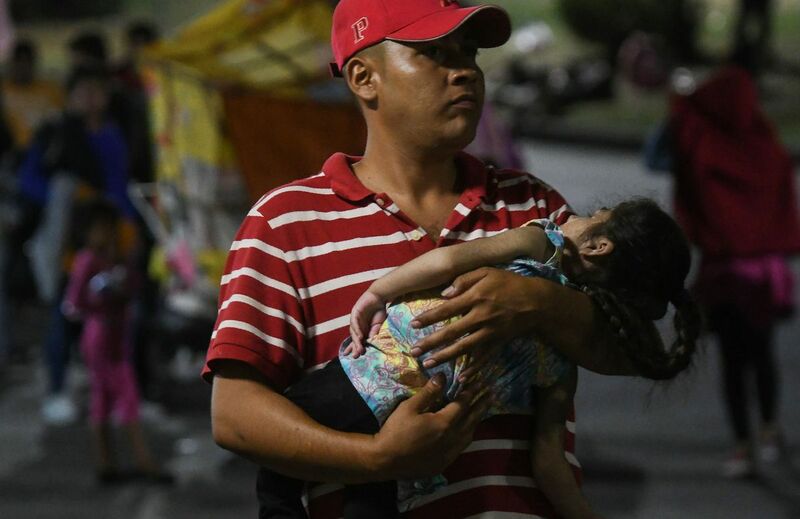 A father waits with his daughter to board a bus that will take them out of Honduras to Guatemala — and from there to Mexico and (possibly) the United States. According to some estimates, the number of Hondurans and Guatemalans apprehended at the US/Mexico border this year will reach almost 1 percent of those countries’ populations. If the aid cutoff includes security aid, that would likely be immediately counterproductive, because it would make it much harder for the US to conduct anti-smuggling and anti-trafficking operations in the region — and much harder for the governments of the Northern Triangle countries to do that themselves. The aid cutoff also threatens to damage the US-Mexico relationship. The López Obrador government has maintained a rhetorical commitment to a “Marshall Plan”-style investment in Central America — and the US’s rhetorical agreement that such development was necessary helped justify Mexico’s cooperation on immigration crackdowns. With the aid cutoff, the Trump administration is sending the message that it doesn’t actually agree with Mexico’s vision for the region — just as it ramps up pressure on Mexico to do more to target Central American migrants as a way to help Trump. 9) What are other solutions? The answer to this question depends on what you see as the problem. Immigration hawks see it as too many people coming into the US without papers whose asylum claims won’t ultimately prevail; immigration doves see the problem as the conditions in Central America that migrants are fleeing, and the conditions in which they’re held while in the US. There are plenty of ideas in the former category. The problem is that the ideas are not getting the support they would need to actually happen. The US would like to get Mexico to sign a “safe third country” agreement that would allow the US to deny asylum to Central Americans, but Mexico has no interest in that. The Trump administration wants to get Congress to deport Central American children without hearings and override the court settlement that prevents long-term family detention, but House Democrats aren’t biting. The White House wants to change the intentionally generous “credible fear” standard in asylum screening interviews so that fewer people are allowed to stay and apply for asylum (increasing the risk that legitimate asylum claimants will get returned to danger), but the legal concerns about that are so intense that it might have to purge generally like-minded officials from the Department of Homeland Security to carry out the plan. In the latter category, it’s easy to point to things that the administration should stop doing, like keeping families outdoors in cage-like holding pens. A humanitarian agenda could also include more case management outside of detention, to increase the odds that families show up to hearings, or even broader access to counsel in immigration proceedings (which isn’t guaranteed under current law). But it’s not clear how much money the administration would need to invest in order to take proper care of the families coming in now, or how quickly that could be done — and it’s not clear how many more families are going to come in the coming months. The old consensus that the US needed to help address the “root causes” of migration, by investing in the Northern Triangle countries and making it more appealing for people to stay, was never supposed to be an immediate solution to anything. Of course, Trump’s view of migration makes it less likely that anyone will be able to start work on long-term solutions that might bear fruit down the road. It is almost certainly, in the meantime, going to get worse before it gets better.